Over the last few weeks, a coalition of shooting organisations, led by the CFCV, engaged one of the most experienced and capable political consultants, to pull a submission to State and Federal Governments to address the changes to the National Firearms Agreement we weren’t told about. The organisations are Victorian Amateur Pistol Association, International Practical Shooting Confederation, Sporting Shooters Association of Australia (Vic), Sporting Shooters Association of Australia (NSW), Field & Game Australia and the Antique & Historical Arms Collectors Guild of Vic. Here is the submission the sent to Justice Minister, Michael Keenan, earlier this week (click here to download it). It is also being sent to other MPs to gain support for a pull back on these changes. SIFA has made a similar submission. What does the industry submission address? The federal Minister for Justice Michael Keenan gave assurances that the only changes to the NFA will be those necessary to re-classify lever action shotguns and to accommodate technological change. However the proposed new NFA goes further than this and would make owning firearms more difficult and more onerous. A number of ‘optional’ provisions – such as imposing a 28 day waiting period to obtain a ‘Permit-To-Acquire’ – would now become mandatory. It also encourages to states to ramp up storage requirements and require the making of new regulations for dealers, and others. The changes also would affect collectors and would impose new obligations on some collectors which required them to destroy their property. The response calls on Minister Keenan to ensure that the changes in the proposed NFA Agreement which are not related to re-classifying lever action shotguns or technological change are deleted. Another issue is that some state or territory governments may come under pressure to use the new NFA agreement as an excuse to change existing legislation, policies and protocols, which have been in place for 15 to 20 years, to make it more difficult or more onerous to own firearms. 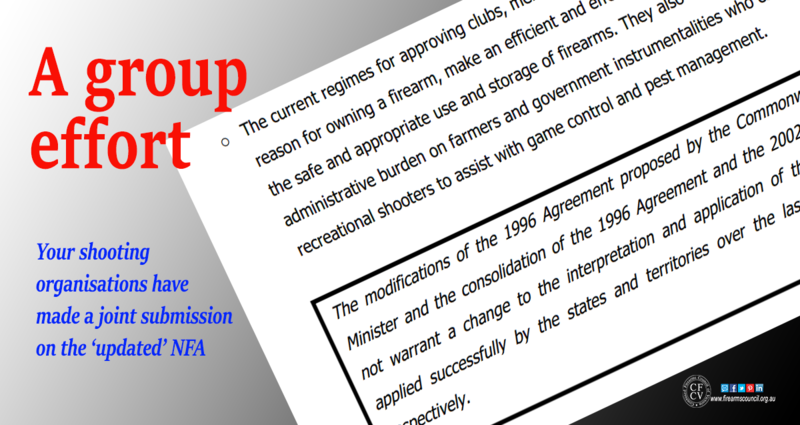 The organisations which are members of this coalition are speaking to federal and state politicians to ensure that there are not any changes to firearms ownership at a federal or state level other than changes concerning the classification of lever action shotguns. The response also revisits two key problems out of the 1996 NFA, which are the narrow disciplines which are recognised for ‘genuine reason’ to obtain a licence, and the omission of junior licences. The response does not challenge the reclassification of lever-action shotguns, but those things which were not announced and probably unknown to Minister Keenan. We’ll deal with the lever-action shotgun issue later on. This work involved the engagement of a professional to assist us and did not come cheap. The CFCV contributed a considerable sum, as did others, to fund the work. That’s what your donation to the CFCV does – it helps us do this sort of work. Want to help us do more? It’s easy! Just click the blue “Donate Now” button. Shooters are encouraged to speak to their federal and state members of parliament to reinforce this message. If you need help in finding out the names of your local members please post a comment here with your suburb and we’ll let you know who it is. Wow that’s quite a detailed submission spelling out each & every change like that and hopefully money well spent , lets hope Keenan doesn’t do to us what he did during the NFA review “consulting” period and completely ignore it, this is the sort of thing that needs to get a lot of publicity with other pro shooting political party’s and politicians that that are sympathetic to our cause, we have the bullet now we need to load it (pun intended) into some political clout. Well done to national firearms lobby! We need a more practical solution to legal firearm owners. If the government and policing bodies targeted illegal use possession then that’s money well spent on their behalf not waiting tax payers and firearm owners money. GENUINE REASONS AND NEED FOR ACQUIRING, POSSESSING OR USING A FIREARM 9. Individuals must demonstrate a genuine reason for acquiring, possessing or using a firearm. The genuine reasons and relevant qualifying statements are listed in paragraphs 13-23. 10. Personal protection is not a genuine reason for acquiring, possessing or using a firearm. 11. Over and above satisfaction of the “genuine reason” test, an applicant for a licence must demonstrate a genuine need for the particular type of firearm (excluding Category A firearms). Does this mean that we have to show a NEED for every firearm we own? Does this mean that it is now illegal to use a firearm in the defence of ourselves & our families? It always has been illegal to use a firearm for self-defence in Australia. ”A raft of changes which even he probably didn’t realise had been snuck in by his bureucrats”.Is our minister asleep at the wheel ? Does he ever read the proposed legislation ? If he plays dumb and it becomes law will he repel it at a first opportunity ? I think not !!!!! Thank Keith. That’s because those provisions are not new. They are out of the 1996 NFA while our work was focusing on the 2017 NFA (in respect of the changes). That said, I’m sure we’ll be doing a lot more work on issues which came out of both versions (plus the 2002 handgun agreement) but our priority is to focus on the changes which were made by the bureaucrats in the shadow of the lever-action shotgun issues.